Therefore, both members of the couple should understand the intentions of marriage in scripture and tradition, and deepen their understanding of marriage through conversations with our clergy. Historically, people have come to St. John’s because the Christian faith is a part of their background or courtship or both, and they want it to be a meaningful basis for their future life together. Who may be married at St. John’s Church? Parishioners of St. John's Church are welcome to seek the support of its clergy as they prepare to marry. The Canons of the Episcopal Church require that a 30-day period of notice be given to the clergy prior to the marriage date and that at least one of the two persons to be married must be baptized. Additionally, divorced persons should seek additional preparation given their previous history of marriage. No service of Holy Matrimony may be conducted at St. John’s Church without our clergy present. Additional Episcopal clergy and clergy of other denominations may be involved in the service, at the discretion of the clergy. When clergy outside the staff of St. John’s are involved, it is proper for the rector to extend a formal invitation. How are wedding arrangements made? After reviewing all information on this page and agreeing that Christian marriage is the desire of both parties, the couple telephones the parish office and makes an appointment to meet with the clergy. No wedding may be scheduled until the couple has met with the clergy. Couples typically meet 3-4 more times with the clergy. They discuss family of origin, areas of conflict, the life of faith, personal finances, intimacy, and significant prior relationships. Sometimes couples about to be married are invited to an evening with "veteran" couples of the parish to share stories of struggle and triumph. Tell us about the nature of the service. Marriage at St. John’s Church is performed within the rich tradition of the Episcopal Church. 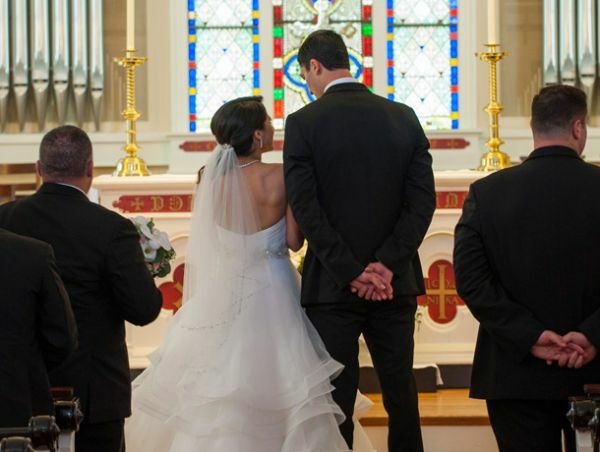 The "Celebration and Blessing of Marriage" as contained in the Book of Common Prayer is the normative form for the service and allows many opportunities to for making the service personal. What time of year is best for weddings? Weddings are discouraged in the liturgical season of Lent and there are no weddings during Holy Week. Also, no weddings are held the week before or after Christmas. Otherwise, weddings are scheduled as clergy are available. The rehearsal is the opportunity, generally the night before the ceremony, for the wedding party to review the mechanics involved in the service itself. It is an enormously important part of the wedding preparation, in that it provides the opportunity to answer any questions involving the service itself. It lasts about an hour and involves the entire wedding party “walking through” the wedding service. The wedding party should contact the parish organist well in advance of the wedding date to work with her on the music. The only restriction upon music is that choices must support the symbols of the church service. We recommend that they come from the rich tradition of music written for the church. Click here to download a list of appropriate musical choices. If an outside organist is to be used, St. John’s organist will be paid a “bench fee” of $150. Additional musicians (soloists, harpsichordists, violinists) are possible, and arrangements may be made with the assistance of the organist. Singers or instrumentalists are responsible for furnishing their own music and a copy of the accompaniment for the organist, preferably in the key in which it is to be performed. Flash photographs of arriving guests, ushers, bridesmaids, bride and groom are acceptable prior to the service. Posed photographs may be made of the wedding party at the altar before or after the service. The outdoor chapel, including the church garden, is also available for photographs and posed groupings. Flash pictures from the vestibule (the small entrance hall) may be made of the bride and other members of the wedding party during the entrance and exit processions. Photographers are NOT allowed to ask the participants to stop during the entrance or exit processions. The professional photographer is permitted to take non-flash pictures during the entrance and exit processions from the balcony if he or she has a very quiet camera. It is the responsibility of the bride or groom to make our rules and parish customs clear to photographers and to all persons attending the wedding. What can you tell me about flower arrangements for a wedding? If your wedding is on a Saturday, you may use the altar flower arrangements which St. John’s Flower Committee provides for Sunday services. Call the church office if special colors are requested. Supplemental or premium altar flowers may be requested and paid for by the family. Any additional flowers are to be provided by the wedding party. No tape or staples are to be used in the church. Also, no aisle runners are permitted at St. John’s. If the wedding is held during the week before the flowers have been arranged for Sunday services, the altar flowers must be provided by the family. What is the Blessing of a Civil Marriage? The church is happy to bless a civil marriage, and in many parts of the world it is normal for people to be married first in a civil ceremony, and then go to the church for the blessing of the marriage. The same policies and Canon Laws, as described in this booklet for a church wedding, apply to the blessing of a civil marriage. Is it possible to dress at the church? Though limited, space is available for both bride and groom to dress for the service. Arrange a time with the church office to enter the church on the day of the wedding. If you are having a rehearsal dinner, it is best to hold it following the rehearsal itself. If you want the officiating clergy and his or her spouse to attend the dinner, please let them know in advance and send an invitation. LICENSES SHOULD BE GIVEN TO THE CLERGY AT THE TIME OF THE REHEARSAL. Weddings cannot go forward unless the clergy has seen the license before the service. Throwing of rice, birdseed, confetti or rose petals is not permitted. If bulletins containing the order of service are desired, the wording is subject to approval by the officiating clergy in advance of printing since it is a worship service and represents the church as well as the couple. The couple is responsible for arrangements with a printer. Suggested contribution of $1,500 – check should be made payable to St. John's Church. Suggested contribution of $500 – check should be made payable to St. John's Church with Rector's Fund in memo line. $250 – check should be made payable to St. John's Church with Carol Weitner, Organist in the memo line. Rehearsal - $50 per session, excluding immediately preceding ceremony. Additional $50 to accompany soloists or instrumentalists. to St. John's Church with Sexton in the memo line. Please note: All fees and offerings should be in the office prior to the rehearsal. The church and clergy offerings are tax deductible.